and it will be available soon. Thank you! As of the date you sign up and pay your fee of $150.00 (plus applicable sales tax) you will be entitled to receive during that calendar month one Signature Facial AND one Signature Massage; except that, if you sign up on the last day of a calendar month, then your sign-up payment is with respect to the following month and you will be entitled to one Signature Facial AND one Signature Massage during that following month. On the last day of each calendar month during your membership, your credit card will be charged the sum of $150.00 (plus applicable sales tax). That charge will entitle you to receive Signature Facial AND one Signature Massage during the following calendar month. A discount of 10% off all facial retail purchases. 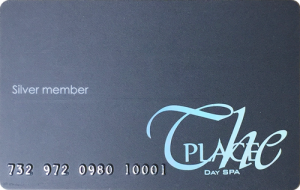 A $100.00 Spa Gift Card on your birthday. As of the date you sign up and pay your fee of $79.99 (plus applicable sales tax) you will be entitled to receive during that calendar month one Signature Facial OR one Signature Massage; except that, if you sign up on the last day of a calendar month, then your sign-up payment is with respect to the following month and you will be entitled to one Signature Facial OR one Signature Massage during that following month. On the last day of each calendar month during your membership, your credit card will be charged the sum of $79.99 (plus applicable sales tax). That charge will entitle you to receive one Signature Facial OR one Signature Massage during the following calendar month. A $50 Spa Gift Card on your birthday. Get 4% Reward Point with Cash payment. Get 2% Reward Point with Credit Card payment. Redeem toward any service once you accumulate $10 reward points. 50% OFF Spa services on your birthday month.